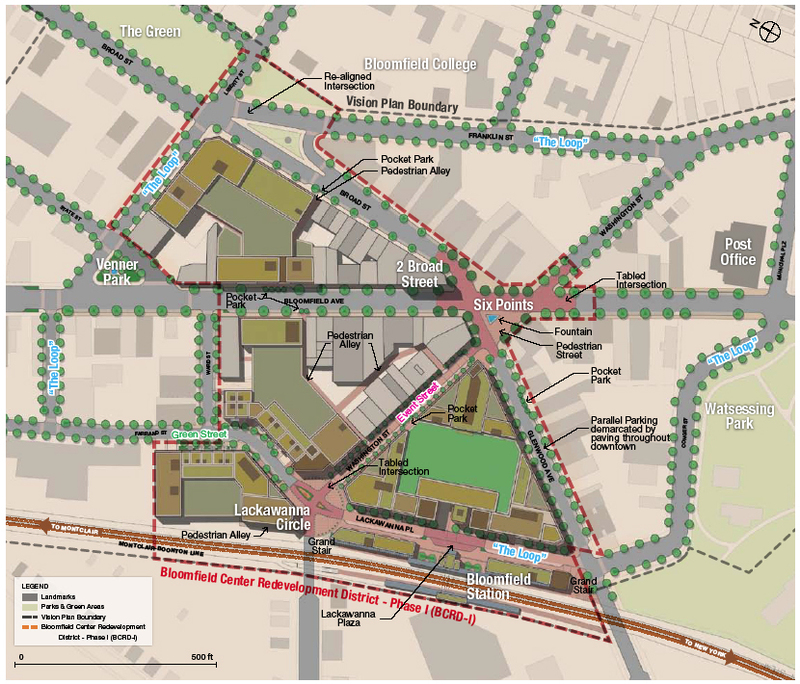 Concept plan for Bloomfield's town center redevelopment. Township officials in Bloomfield faced an unusual set of challenges as they sought to revitalize their traditional downtown area, which has been in slow decline for nearly 25 years. Their first effort, the Bloomfield Station Redevelopment Plan, sought to re-energize the area surrounding the Bloomfield Lackawanna rail station by declaring it an “area in need of redevelopment.” This plan was derailed, however, by local opposition and legal action. General Community Goals: Residents were asked to provide input regarding a variety of topics including parking locations, downtown assets, streetscape elements and pedestrian circulation. • Shaping the Downtown: Participants considered and discussed the elements that influence the “look and feel” of the downtown including building form, storefronts, signage, streetscape, ur¬ban design and green building criteria. Architecture: Three topics—rehabilitation and infill, architectural style and architectural form and roofscape—were discussed in greater detail in small group settings. What emerged from this inclusive process was a “Vision Plan” describing the key characteristics and core elements of Bloomfield’s redevelopment: a historic urban center, a New Jersey urban lifestyle, a transit village, a “green” downtown and an accessible downtown. The plan invokes a comprehensive set of principles for economic, social and environmental sustainability, emphasizing the critical importance of meeting the needs of the present without compromising the ability of future generations to meet their own needs. In support of these principles, the plan proposes enhancements and development densities that will capitalize on the existing infrastructure to create a downtown that maximizes accessibility through an integrated set of transportation modes including walking, bicycling, cars, bus and train. 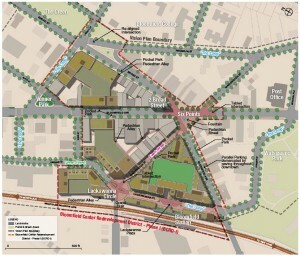 The Vision Plan was ultimately adopted as the Bloomfield Center Redevelopment Plan – Phase 1 by the governing body in December 2008. A unique element of the plan is the delineation of both redevelopment areas and a rehabilitation area. Invoking a seldom-used option in the state’s Local Redevelopment and Housing Law, the plan identifies certain parcels that remain in private ownership while others are incorporated into designated redevelopment areas, including a modified Bloomfield Station Redevelopment Area. The stated goal of this new plan, embraced by public officials and private citizens alike, is to balance the best interests of the township as a whole with the rights of individual property owners and residents. The stated goal of this new plan, embraced by public officials and private citizens alike, is to balance the best interests of the township as a whole with the rights of individual property owners and residents. One area given particular attention is the historic “Six Points” intersection, where Bloomfield Avenue intersects with Broad Street, Glenwood Avenue and Washington Street. This intersection, long identified as Bloomfield Center, has served for decades as a transportation hub and shopping district for residents and commuters in downtown Bloomfield. It is now part of the Bloomfield Center Special Improvement District, established in June 2001. Over the past eight years, the Bloomfield Center Alliance has been managing this district and has made significant efforts to revitalize it. Ultimately, the plan envisions “Six Points” as a pedestrian hub. With the addition of safe, well-lit mid-block pedestrian alleys and connections, visitors will have convenient and interesting ways of walking throughout the downtown. Bicycle lanes and conveniently placed bike racks will also encourage riders from intermediate distances to participate in the downtown experience without driving. Recognizing, however, that cars will continue to be a significant part of the transportation mix, the Bloomfield Parking Authority is undertaking a downtown-wide parking plan, which will ultimately include the construction of new structured public parking—one of many public improvements that will facilitate the redevelopment, rehabilitation and revitalization of downtown Bloomfield. The Redevelopment Plan’s ultimate success will depend on the ability for it to be implementented. To that end the plan includes a section that analyzes development plan scenarios that were developed with input from property owners and interested developers. Those plans will be utilized as a base from which the town will negotiate with multiple redevelopers for large and small infill developments and rehabilitation and reuse of existing buildings. The plan also addresses public streetscape and open space improvements as well as a façade improvement program that will incentivize and complement the private developments.